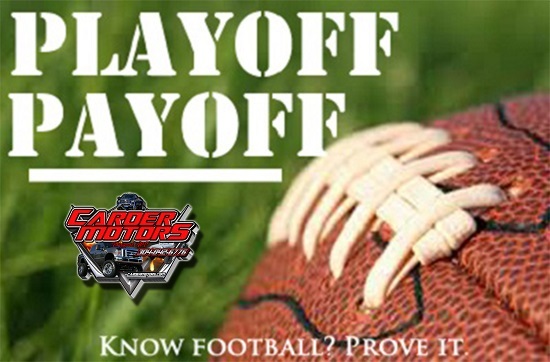 Year seven of the Carder Motors Playoff Payoff Football Pick’em competition has been in the books for more than a month now. However, the end-of-the-contest winners involved in a contest that has well over $1,000 in prizes have talked once again about their participation. This year, there’s some really big news on the competition front. And it involves the 2018 winner. Bridgeport resident Kevin Carbacio has announced that he won’t be competing in future competitions, which should be good news for the rest of the field. Carbacio is not only a back-to-back winner of the Pick’em, he’s the only three-time winner and a two-time runner-up. Only one other individual has won more than one year. Fellow city resident and former educator and Coach Hugh Gainer has won the contest twice and also has a runner-up finish as part of his total. For those thinking it’s an easy feat to do, it’s not. This year, another record year for participants, saw hundreds register for the weekly competition. After three winning years, however, Carbacio decided to step aside. “It’s time to give someone else a shot at the money,” said Carbacio. Carbacio’s “money” this year was actually a gift certificate. However, it was a pretty large sum as Carbacio chose the $500 gift certificate from The Meadowbrook Mall. For those that know Carbacio, they’re probably not surprised. The former North View resident and Liberty High School graduate has played since the inception of the contest with continued success. The sports fanatic is also a regular participant in fantasy football. The individual finishing in second this year was the only individual not from Bridgeport and not from Harrison County. Michael Andrew, who recently lived in the South Harrison are, earned the runner-up slot. Andrew, who recently moved to Preston County, may be new to the winner’s circle. He isn’t new to the competition as he’s played now for three years. “I’m just a huge fan of football and local sports … I have coached baseball in Clarksburg for several years so I know several of the local football players,” said Andrew. The well-traveled Andrew also represents three other counties as well. He is a graduate of Buckhannon-Upshur High School and has also graduated from Alderson Broaddus and West Virginia University. And like Carbacio, he follows the games closely in another endeavor. “I do play fantasy football on a yearly basis,” said Andrew. As the second place finisher, Andrew had his choice of the two remaining prices. Andrew chose the package that included Curtis Fleming Fly Rod Chronicles gear that featured a hat, t-shirt, head ware, decals and a Christmas ornament; along with two $25 Buffalo Wild Wing gift cards, one Almost Heaven Desserts gift card, one $50 Social Tap gift certificate and one $25 gift card from Mia Margherita. Coming in third is a very familiar name in the Bridgeport area. Kelly Ayoob, who has finished in the running for several seasons, finally broke through and came in third place this year. Ayoob comes from a sports family and her children are involved in athletics throughout the city. 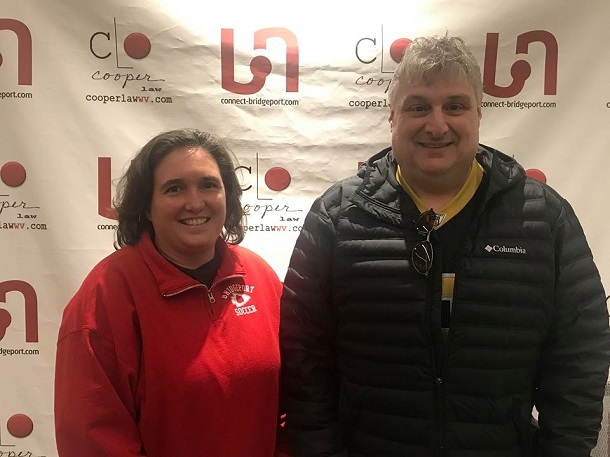 Many also know her husband Brian, one of the top players in Bridgeport High School basketball history who played in the mid-1980s for the Indians. “I’ve been playing since the beginning,” said Ayoob. As for how she does so well? “I listen to my husband,” said Ayoob with a smile. “We have a very sports-oriented family. Both of our boys are involved in a variety of sports. While Ayoob lives in Bridgeport, she also represents another local county. Ayoob is a graduate of Elkins High School. And unlike the top two finishers, she does not play fantasy football. Ayoob was the winner of the two prizes not chosen by Carbacio and Andrew. The prizes the first-time top three finisher received included a Bose Waterproof Soundlink Soundbar, two $25 Buffalo Wild Wing gift certificates, one Almost Heaven Desserts gift card, and a gift certificate for two complimentary meals at T&L Hot Dog. Connect-Bridgeport would like to thank Carder Motors for once again sponsoring the contest. Also, a thank you to our weekly prize sponsors of Buffalo Wild Wings and Almost Heaven Desserts along with those providing the year-end contest prizes. Editor's Note: Show above is Kelly Ayoob and Kevin Carbacio, two of this year's three top prize winners.